Sometimes, grocery shopping in New York can be a real chore. At first, I hated it. Sacrilege, I know, but before you throw something, hear my out. In New York, before you get a feel for what's out there, one-stop shopping can be virtually nonexistent. "You have bread flour but not yeast? Okay, I'll go somewhere else. But I'd better haul that bread flour with me, because there's no guarantee they'll have it at the next store..." Going to three different places to find a grapefruit is par for the course. And although this doesn't sound like a big deal, I don't have a car here in the city. So there's no throwing groceries in the back seat and stopping off at the next place. No, I have to walk. And carry. And carry on the subway. Sometimes I even work up a sweat, which I do NOT admit to lightly. 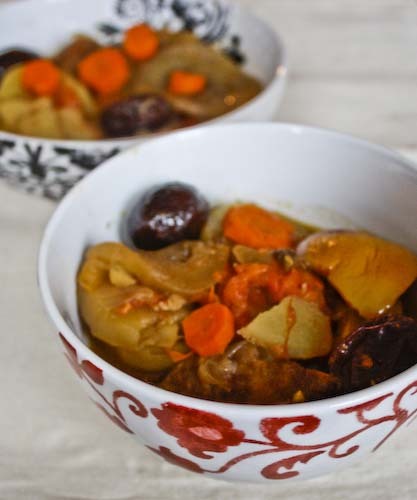 In this case, shopping was something like a scavenger hunt, and one of the best things to come out of this recipe, other than a great big pot of deliciousness, was definitely Tashjian Karnig (Lex between 28th and 29th for those of you in NYC). It is a revelation and my new favorite place. Sometimes heading into an ethnic market can be intimidating, and in New York it's like stepping into another world, usually complete with a foreign language, and if you're paranoid, people wondering what that incompetent white girl is doing bumbling around in here. But I was too overwhelmed to be shy and just walked in circles around, and around the teeny store overflowing with all things Middle Eastern. Besides, since I had specific things to look for, it was very easy to appear occupied. 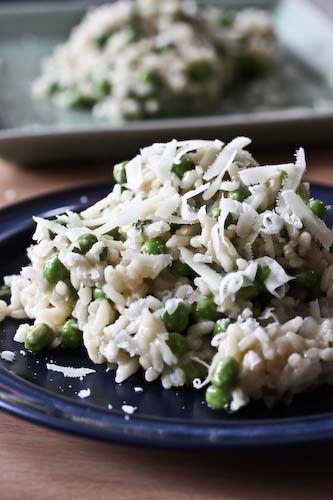 The recipe comes from Najmieh Batmanglij's Food of Life (the older version, there's also an expanded New Food of Life out that gets excellent reviews, but this is the version I have). I made a few adjustments to the original recipe, and my version is what you find bellow. Nothing major, and it still turned out, well, wonderful! When skimming the recipe, if you notice the prunes and think "ewww" please please please reconsider and don't leave them out. 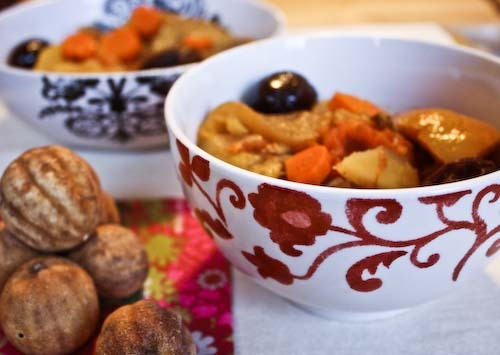 The slow stew turns them into delectable and deeply flavored little balloons of goodness that burst on the tongue. If calling them "dried plums" helps, do that. Also, I drained my eggplant before adding it, although the recipe doesn't call for this step and thinking back now, it's probably extraneous since they're being cooked for so long with so many other things. 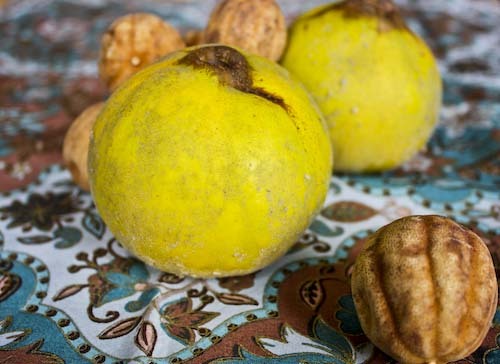 And if you can't find quinces, replace them with apples. 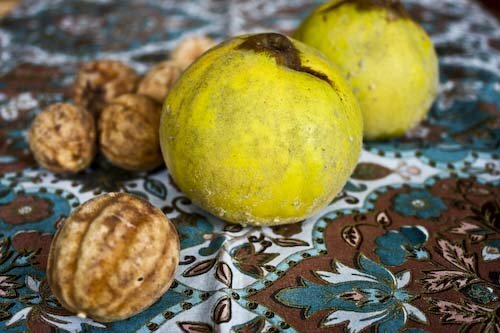 You don't need to peel the quince, but be sure to wash them, especially if they're charmingly fuzzy. Pour 2 tablespoons oil into a large, heavy Dutch oven. Layer the first 8 ingredients in the pot in the order they're listed. Top with the prunes, then pour in the remaining oil. Sprinkle the advieh on top, as well as the turmeric, salt, pepper, dissolved tomato paste, saffron and limou-omani. Cover and cook for 2 hours on low heat. After 2 hours, remove the lid and mix the contents around a little. The veggies will have released their juices forming a succulent broth. Bring the broth to a gentle simmer, re-cover and continue to cook until done, around another 1.5 hours. Serve and enjoy! You are lucky that you have access to all kinds of ingredients, even if you have to run all over the city to find them! When we lived in London I would take Tubes and buses to find certain things and I loved it! I love middle eastern flavours, this looks really tasty. Snooky Doodle, I love prunes! My fiance picked all of them out and wouldn't try any, but that just meant more for me! Dana, I know, I really am lucky even if I complain. Thanks for humoring me! Sam, this soup was easy once the grocery shopping was done!